Power over Ethernet (PoE) equipment adds power to the data in Ethernet wiring-so that devices such as surveillance and card access machines can be powered via standard Ethernet cabling. PoE applications require a 48 VDC power source, but most automation systems run from 24 VAC/VDC power. 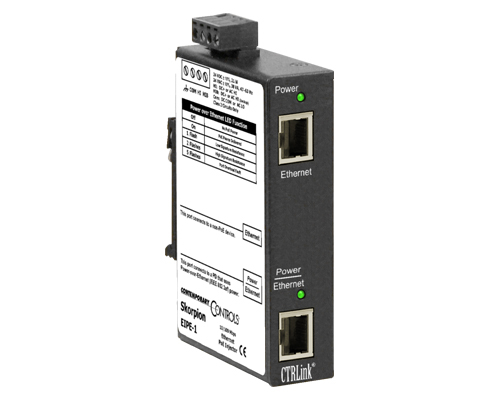 If only one Ethernet Powered Device (PD) needs power, the Skorpion PoE Injector can provide it. The EIPE-1 operates from 24 VAC/VDC and internally generates the 48 VDC PoE power for the Powered Device (PD)—eliminating grounded primary power concerns while providing isolated 15.4 W power output. It injects 48 VDC into the Ethernet cable to provide both power and data to the PD. The Skorpion PoE Injector has two RJ-45 connectors. The upper connector attaches to the upstream device. The lower one attaches to the end device. Transmit and receive signals pass between the two connectors as if the mid-span device were not present. The Skorpion PoE Injector supports the 802.3af protocol. It has a rugged metal enclosure and metal DIN-rail clip for control panel mounting. The Skorpion PoE Injector is powered from a 24 VAC/VDC source-eliminating the need and expense of the 48 VDC power supply typically associated with PoE equipment. In many industrial control systems 24 VDC is readily available in the control panel, just like 24 VAC is available in a BAS system. Using its received power, the Skorpion PoE Injector internally generates the 48 VDC PoE power for the Powered Device (PD)-eliminating grounded primary power concerns. With the Skorpion PoE Injector powered up, an Ethernet cable is attached to the PD. No power is delivered to the PD until a valid 25 kO resistance, called the signature, is sensed by the Skorpion PoE Injector. Once this value is sensed, the Skorpion PoE Injector applies power to the unused pairs and thereby powers the PD. Even if the total cable length is 100 m, the PD receives a minimum of 12.95 watts at its power pins.